The well-known columnist Dave Barry has the best year overview of 2009 I've seen yet. My wife read the first few paragraphs to me this morning--we were laughing so hard I almost hurt myself. It was also a year of Change, especially in Washington, where the tired old hacks of yesteryear finally yielded the reins of power to a group of fresh, young, idealistic, new-idea outsiders such as Nancy Pelosi. As a result Washington, rejecting "business as usual,'' finally stopped trying to solve every problem by throwing billions of taxpayer dollars at it and instead started trying to solve every problem by throwing trillions of taxpayer dollars at it. BAD NEWS: The economy remained critically weak, with rising unemployment, a severely depressed real-estate market, the near-collapse of the domestic automobile industry and the steep decline of the dollar. GOOD NEWS: Windows 7 sucked less than Vista. BAD NEWS: Ominous problems loomed abroad as -- among other difficulties -- the Afghanistan war went sour, and Iran threatened to plunge the Middle East and beyond into nuclear war. GOOD NEWS: They finally got Roman Polanski. In short, it was a year that we will be happy to put behind us. But before we do, let's swallow our anti-nausea medication and take one last look back, starting with. . . .
. . . during which history is made in Washington, D.C., where a crowd estimated by the Congressional Estimating Office at 217 billion people gathers to watch Barack Obama be inaugurated as the first American president ever to come after George W. Bush. There is a minor glitch in the ceremony when Chief Justice John Roberts, attempting to administer the oath of office, becomes confused and instead reads the side-effect warnings for his decongestant pills, causing the new president to swear that he will consult his physician if he experiences a sudden loss of sensation in his feet. President Obama then delivers an upbeat inaugural address, ushering in a new era of cooperation, civility and bipartisanship in a galaxy far, far away. Here on Earth everything stays much the same. The No. 1 item on the agenda is fixing the economy, so the new administration immediately sets about the daunting task of trying to nominate somebody -- anybody -- to a high-level government post who actually remembered to pay his or her taxes. Among those who forgot this pesky chore is Obama's nominee for Treasury secretary, Timothy Geithner, who sheepishly admits that he failed to pay $35,000 in federal self-employment taxes. He says that the error was a result of his using TurboTax, which he also blames for his involvement in an eight-state spree of bank robberies. He is confirmed after the Obama administration explains that it inherited the U.S. Tax Code from the Bush administration. Elsewhere in politics, a team of specially trained wildlife agents equipped with nets and tranquilizer darts manages, after a six-hour struggle, to remove Illinois Gov. Rod Blagojevich from office. He is transported to an undisclosed swamp, where he is released into the wild and quickly bonds with the native ferret population.
. . . that Congress passes, without reading it, and without actually finishing writing it, a stimulus package totaling $787 billion. The money is immediately turned over to American taxpayers so they can use it to stimulate the economy. No! What a crazy idea THAT would be! The money is to be doled out over the next decade or so by members of Congress on projects deemed vital by members of Congress, such as constructing buildings that will be named after members of Congress. This will stimulate the economy by creating millions of jobs, according to estimates provided by the Congressional Estimating Office's Magical Estimating 8-Ball. Despite this heroic effort, the economy continues to stumble. General Motors, which has sold only one car in the past year -- a Buick LaCrosse mistakenly purchased by an 87-year-old man who thought he was buying a power scooter -- announces a new four-part business plan, consisting of (1) dealership closings; (2) factory shutdowns;(3) worker layoffs; and (4) traveling backward through time to 1955. The stock market hits its lowest level since 1997; this is hailed as a great investment opportunity by all the financial wizards who failed to let us know last year that the market was going to tank. California goes bankrupt and is forced to raise $800 million by pawning Angelina Jolie. The Obama administration's confirmation woes continue as Tom Daschle is forced to withdraw as nominee for secretary of Health and Human Services following the disclosure that he, too, failed to pay all of his federal taxes. He blames this oversight on the fact that his tax returns were prepared by Treasury Secretary Geithner. The Academy Awards are a triumph for Slumdog Millionaire, which wins eight Oscars, only to have them stolen by Somali pirates. 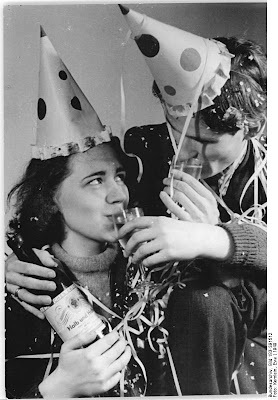 . .
Picture by Eva Kemlein (1949), source: Deutsches Bundesarchiv (German Federal Archive). The Angel had said to the shepherds: "This will be a sign for you: you will find a babe wrapped in swaddling clothes and lying in a manger" (Lk 2:12; cf. 2:16). God's sign, the sign given to the shepherds and to us, is not an astonishing miracle. God's sign is his humility. God's sign is that he makes himself small; he becomes a child; he lets us touch him and he asks for our love. How we would prefer a different sign, an imposing, irresistible sign of God's power and greatness! But his sign summons us to faith and love, and thus it gives us hope: this is what God is like. He has power, he is Goodness itself. He invites us to become like him. Yes indeed, we become like God if we allow ourselves to be shaped by this sign; if we ourselves learn humility and hence true greatness; if we renounce violence and use only the weapons of truth and love. Origen, taking up one of John the Baptist's sayings, saw the essence of paganism expressed in the symbol of stones: paganism is a lack of feeling, it means a heart of stone that is incapable of loving and perceiving God's love. Origen says of the pagans: "Lacking feeling and reason, they are transformed into stones and wood" (in Lk 22:9). Christ, though, wishes to give us a heart of flesh. When we see him, the God who became a child, our hearts are opened. 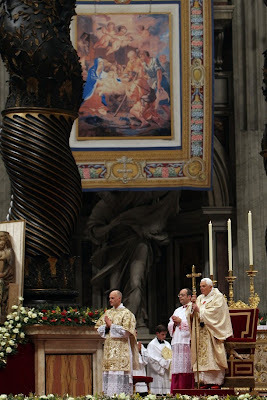 In the Liturgy of the holy night, God comes to us as man, so that we might become truly human. Let us listen once again to Origen: "Indeed, what use would it be to you that Christ once came in the flesh if he did not enter your soul? Let us pray that he may come to us each day, that we may be able to say: I live, yet it is no longer I that live, but Christ lives in me (Gal 2:20)" (in Lk 22:3). For what it's worth, I think McCarthy is right. And restricting Old Testament catechesis to a study of Wellhausenian source criticism, which is actually done in some places, is, I think, not the way to go. What does everyone else think? Well, another SBL is come and gone, and I've spent the last week doing what I do every year the week after SBL: being torn apart between reading all the new books I bought and finishing up my semester of teaching work and finals grading. This year, I have given in to temptation and can't stop reading Craig Keener's new book, The Historical Jesus of the Gospels (Eerdmands, 2009). I am currently about halfway through it, and, if all goes well, plan on doing a series of short posts on certain aspects of this very important new contribution to the historical study of Jesus. Keener is one of the most learned New Testament scholars writing today, and one of the few historical Jesus scholars who has also penned full length commentaries on The Gospel of Matthew (Eerdmans, 1999) and The Gospel of John (Hendrickson, 2003), of which the latter is arguably the most exhaustive commentary on John penned in the last century or so. For the last few years I've recommended Keener's commentary on John to colleagues not least because the opening chapter on the introduction to John--a chapter which is 330 single spaced pages!--is simply the best introduction to the Gospel I've ever read. (It almost should have been a separate monograph). Anyway, Keener's familiarity with the exegetical issues surrounding the Synoptic and Johannine tradition gives him a special edge and makes his work a unique contribution to the field of historical Jesus research. 1. Although the book looks formidably long, it is actually extremely concisely written. While it totals out at 831 pages, only 350 of those are actually main text. The rest are endnotes (Why?Why? Why?!!!) appendices, indexes, and an over 100 page bibliography. This makes the book much more accessible for a wide audience than it might appear at first glance. I'm currently finishing up the methodology section, so I can't say much about Keener's analysis of Jesus' aims, except to say that Keener himself points out that the main contribution of the book is in the method section, where he draws on his unbelievably vast knowledge of ancient Jewish and Greco-Roman literature in order to situate the genre and writing of the Gospels in their historical context. 3. ...There's still one last observation, more critical than laudatory. There is a strange weakness in the book, which is frustratingly mis-titled. The title, The Historical Jesus of the Gospels, gives the impression that Keener is going to build his reconstruction of Jesus' words and deeds from all four Gospels, not just the Synoptics. However, this book should have been called The Historical Jesus of the SYNOPTIC Gospels, for the Fourth Gospel is (virtually) nowhere to be found. Indeed, before we even get to page 1, Keener declares that he will abstain from drawing on the Gospel of John, for reasons of (1) length (the book is already too long); (2) previous publication (readers can find his thoughts on John in his commentary); and (3) avoiding controversy ("there are enough issues of controversy involved in the present discussion that it seemed superfluous to add another one" Keener, "Introduction," p. xxiv). Second, Keener himself states that the whole reason he wrote this book is because he overheard someone comment at a conference that "If you want those in the historical Jesus field to read your work, you don't stick it in the commentaries." Keener, p. xxix). In other words, the point of the book is to bring the results of his commentary work into the discussion of the historical Jesus. Why should this goal apply to the Synoptics and not to John? In my opinion, this was a real missed opportunity to have an expert in John allow his expertise to have a potential impact on the field of Jesus research. Third and finally, while I can sympathize with the desire to avoid controversy and to pick battles that you can actually win, there is a serious methodological problem with using all of the first-century biographies written within the living memory of Jesus' disciples except John. At the end of the day, it is arbitrary, and by definition skews the overall reconstruction. 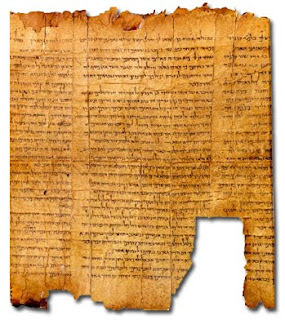 What historical or methodological justification is there for eliminating an entire Gospel from your reconstruction, one which Keener himself regards as a first-century historical biography, written by an eyewitness? Why do this at a time when so many scholars (Keener among them) have recognized the historical value of John's Gospel on a number of points? (e.g., The SBL John, Jesus, and History Group) Again, it would have been very interesting to see how someone who knows John as well as Keener would have actually made use of his Gospel in a historical Jesus book. 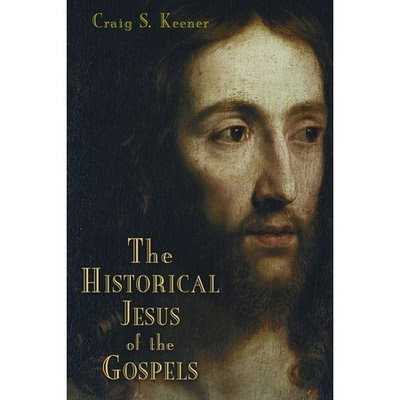 Anyway, these criticisms aside, in my opinion, Keener's work, The Historical Jesus of the Gospels, looks like it could be one of the most consequential books published on the historical Jesus in over a decade. He is to be commended for stepping out of the field of Gospel commentary writing and making such a momentous contribution to Jesus research.